The sled driver is a stocky, high-octane woman in her twenties, already missing a few teeth. She’s untangling the webbed harnesses and judiciously selecting ten dogs to pull a sled for the tourists on a circuit around Beaver Pond. All one hundred dogs are barking feverishly, yanking on their chains, their back muscles taut, tongues hanging loose and slimy. The clamor is maddening. “Once we get going,” she tells us, “they’re surprisingly quiet.” For now, the dogs are strangling themselves, yelping, “Me. Me. Me,” as if their lives depend on being chosen, vying for the few spots to pull the sled twice around the measly three-mile circuit. We’re content to stroll the same loop through the woods, wary of the sled that will inevitably overtake us. For now, the only sound is the crunch of our footsteps on the snow. Without notice, from behind a tall stand of evergreen, there’s a swish of the sled runners, and the faint whisper of panting. 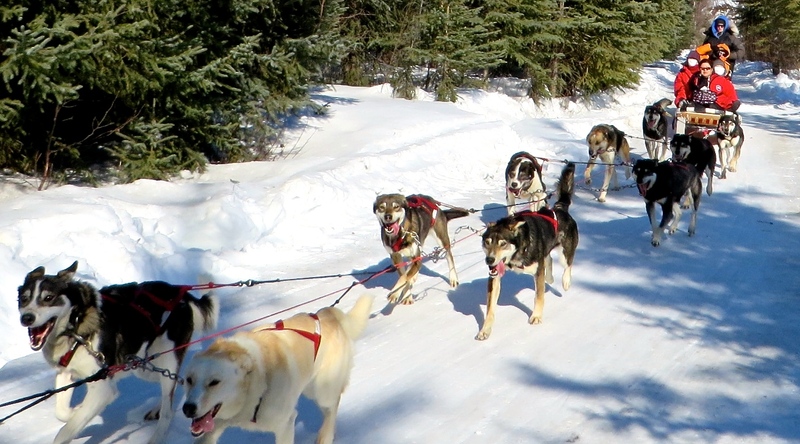 The dogs are on top of us before we have a chance to sidestep the sleds, their paws nearly trampling our feet as we hurl our bodies off the trail. It’s obvious the dogs have no idea how to pace themselves. We’ve traveled from the central coast of California to Chena Hot Springs, some 60 miles northeast of Fairbanks, to chase down the aurora borealis. The air is crisp, the snow a dry powder, and the sky a stunning blue. It’s March. Even though daylight lasts a full 14 hours, we’re so far north, the sun arcs only a few scant inches above the horizon, threatening to set at any moment. Only it doesn’t set until well past nine o’clock, which means all day long, the light is exquisite through the bent branches of evergreen and aspen and birch, and the bluish-white snow. There’s a faint smell of sulfur from the hot springs. That night, we pile into a tank-like van with caterpillar treads, and a driver from the lodge takes us to the top of the mountain for an unobstructed view. It’s 9:30 and the sky is only beginning to blacken. The brightest object is Jupiter and then Mars. In another hour, we’ll be able to see the milky way, but for now we stay warm in a heated yurt, hoping the aurora—with all the miles we’ve traveled to get here—will make an appearance. We drink hot chocolate and periodically dash outside to see the flood of awakening stars and the Big Dipper and Polaris circling directly overhead. At one in the morning, we detect a foggy layer, low in the sky, and then a hazy band of light begins to flutter like a curtain undulating in the wind. We crane our necks and squint our eyes. Not much, but it’s a start. Bundled in down jackets and hats and gloves and ski pants and still the cold has infiltrated our bones. This time we don’t retreat to the yurt. An hour later, the drivers are preparing to leave, our departure pre-determined—regardless of the light show overhead. The band is growing wider with hints of green and blue, but we’re hungry for more—just like our canine friends earlier in the day. Except we’re praying not to the sled driver, but to Aurora, the Roman goddess of dawn. “Me. Me. Me,” we chant. “Show yourself to me. Pretty please.” As if in answer to our prayers, streams of light leap and shimmer overhead, like thick fingers playing on an icy xylophone. It’s not the brilliant green spectacle in photographs, but more muted. In that moment, standing under the glittering milky way, we are witnessing the immensity of a universe that literally goes on forever. A universe made up of the same carbon molecules as our own fragile, frozen bodies. Is this what I came here for? Have I seen enough? Has it been worth the effort? The poet Paul Valéry wrote, “a poem is never finished, only abandoned.” Just as it takes great courage to write, it also takes courage to perceive the sacred moment approaching perfection. To determine that a poem, or a novel, or a painting, or a piano concerto is the best it can be. In the next several months, I will likely be completing the final editing of a novel that has consumed much of the last three years of my life. I don’t dare ask if it’s been worth the effort, except to say whatever struggles I have with the writing life, I’m certain it’s why I’m here. The outcome will have to be enough. The next morning we’re jolted awake by the yelping of dogs in an unrestrained frenzy. I wonder if they lay sleepless last night, anxiously awaiting the shimmering green and blue and red lights that periodically stream across the starlit sky.